Many of our clients ask us ‘why aren’t we ranking at the top of Google?’ – this article is written to answer this question and gives you some tips on how you can address this. Before we start let’s clear up what we’re talking about here. What we want is to get to the top of search engine results. By search engine, we’re talking about Google. By top, we mean the first page as fewer than 2% of searchers ever make it onto page two. To achieve this we need to be optimising our site to be favourable to search engines. This is referred to as SEO or Search Engine Optimisation. This term refers to work done both on your site (onsite) and on other sites that are in your environment (offsite). Many people think that getting to the top of the search engine ranks is free. It isn’t. It will require significant time and effort to get your site ranked. If you want to get on the top of Google right now, today, the only way you can do this is to pay for it via AdWords, Google’s famous advertising platform which has made the founders two of the richest men in the world. To launch a campaign get your credit card ready and click here. Firstly, Google broke the mould when it was launched because it differed from all the other search engines in one big way: it measured sites not simply on what was written on its pages. Pre-Google a web master could load the page full of the keywords it wanted to rank for. So if he wrote ‘Knee Surgeon’ a thousand times on a page the old search engines would rank it on the basis of how often this was mentioned. The problem with this is that it didn’t actually determine whether anyone was really a knee surgeon. In fact, it only really registered the ability to understand how a web page was built which undermined the whole idea of a search engine. Google changed everything because it realised that to keep people coming back they needed to trust it – so it set about delivering the best possible result for the consumer, not the website owner. Knowing this is key to understanding how you appear on the search rankings, or SERP (Search Engine Results Page) as we call it in the trade. Google isn’t trying to help you, it’s trying to help the consumer. Google built its ranking index around an algorithm which measures certain factors and this made it harder to game the system. Although this algorithm has evolved significantly over the years many of these factors that determine how a site is ranked are outside of the direct control of the website owner. Google still wants the most relevant sites to appear at the top but it requires sustained effort on behalf of the site owner to get there. You have to play by the rules to get ranked. In establishing how to rank on Google, it’s important to remember that they want you to engage with the internet in an honest way. This means your site should be regularly updated in a way that a retailer is regularly restocked or a clinic is regularly maintained. Similarly, you should put yourself about a bit and get links from other websites that are in the same sector as you. Google are clever, they measure not just your site but how you fit into the environment in which you operate. Their software performs trillions of website checks (called crawls) per month so they know what it going on and who is connected to who. Also, you should bear in mind that what happens in the SERP battle isn’t just about you. It’s also about what everyone else is doing. So if you are a new website and you operate in a competitive sector in a populated city the chances are there are going to be a lot of people doing what you’re doing to get to the top and they will probably have been doing it a lot longer. Not every search is the same. If you’re in Edinburgh and you search for a knee surgeon the results you see in Google will be very different from those of someone searching for a knee surgeon in London. The search above was performed in Stratford-upon-Avon and you can see that the results are skewed in favour of local practitioners. If you’re a new site you have to earn your position in the ranking table. Like many things in life you get out what you put in and for those who think they can spring to the top simply by putting up a site then I’m afraid you have to think again. There are many sites that have been there long before you who regularly update and work on generating inward links and you need to roll up your sleeves and get stuck in if you want to compete. That said there are also many sites that don’t. In my experience, 80% of healthcare websites are never updated and make no effort to engage with an online audience. The exact Google algorithm isn’t something that is officially published but every now and then they release some information and for those of us in the internet business we know from experience what works and what doesn’t. The following list is an outline of factors you need to address to get your site ranked. Be prepared for the long haul. This very site now ranks position 3 on Google for ‘Healthcare SEO’ and it took about 18 months for us to get there. And we’re still fighting to get to that top position! Check it out here. These are links from sites that have some relevancy or connection to what you do. This can be trade bodies, hospitals, clinics, directories and other websites that you may be associated with. Google will crawl your site on average every few weeks. The more you change your site (by adding content) the more frequently the site gets crawled and more Google will rate you. Adding pages to your site also increases the size of your site and it’s footprint on the internet making it more likely to get picked up by potential clients. It’s important to add content and also equally important to flag it so that search engines get a clear signpost to what you are talking about. Your site should be built to deliver the optimum user experience. Remember Google is all about providing the best results for the consumer. A responsive site will deliver a different site layout depending on which device is used – it responds to the device, hence the responsiveness element. Interestingly, half of your website traffic will now be coming from portable devices. A well-built site with fast code free from malware is a given. If your site is older than 10 years old then consider an upgrade. Slow sites are a curse. Your site should load within 2 seconds. Ask your developer to make sure images are small and that the code is optimised for fast loading. Google respects its elders. If a site has been around for a while and ticks all the other boxes then it will do well. Longevity on its own however isn’t enough to win in the ranking war so if you’re a new site don’t worry too much as the other factors all count. Remember to say what it is that you do on your site. Google bots don’t have the ability to view how beautiful a site is, they are interested in what’s written on the page. As an interesting experiment if you want to know what Google sees when it crawls your site then put your web address in this tool and it will show you what it looks like to a machine. Does it say clearly what you do? Our business specialises in helping clinics and practitioners get found online – if you want some help, advice or just a chat then contact Gavin on 0774 009 8092 or email Gavin@bhmmedia.com. So you want to get to the top of Google for your specialty – that’s natural, not just for business but also for professional pride. If you’re the best then Google should be showing you at the top. There are thousands of companies who promise to do this and you may have even tried a few. Certainly this is why our media company has got into SEO, it’s because we had been let down so many times that we decided to learn from the ground up how it’s done. Last year we set out to put our money where our mouth is and get to the top of Google for our main speciality which is healthcare SEO. The top organic positions (ie the positions you don’t pay for) that really count are the first four. They get 60% of all clicks to the page. The remaining 40% is split between adverts and the bottom six. Only two percent will bother to go onto page two. 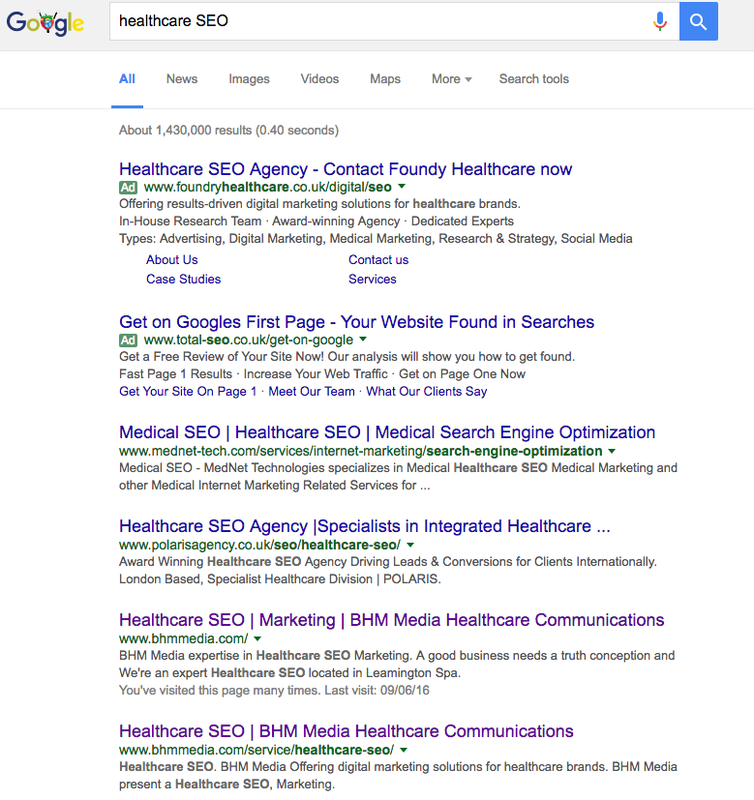 If you have time then Google ‘Healthcare SEO’ – you’ll find us there in the top three. Here’s a screengrab I took earlier today. There is no behind the scenes magic or dodgy dealing done to create this result. Here’s what we did. We made sure our website told Google what we did. You’ll be amazed at how many companies don’t do this. Simply discussing it on our website and talking about it regularly is enough to do this. Don’t go over the top with stuffing your site with your keywords, a natural approach will work. We also made our site easy for Google to read which meant having a well built site. We use WordPress which is loved by search engines. Other considerations are making the site fast to load, making it work nicely on mobile devices (half your traffic will be from people using tablets and smart phones), naming your images as the thing you do is another easy box to tick. We can give you a step by step guide to getting your site on track for free. Put your details in our website checker and we’ll send you a bespoke report on how your site is performing and the steps you need to take to fix it – click here. The search engines look at your site and then then look at how you are perceived online. If nobody links to you then they assume you’re not that important. An inward link can be something as basic as a listing in a local directory or professional directory. If you have an affiliation from a hospital or clinic then get them to link to you. If you’ve done something interesting tell the press about it – getting the email address for a journalist is the easiest thing in the world and remember: they are looking for a story! Nearly all journals, magazines and news outlets are online so push yourself out there. Think about who you can talk to about getting to link to your site. As with all things SEO be natural. You don’t want a link from a local cement factory and contrary to what you hear you don’t need thousands of links. One or two well respected links from relevant websites will be hugely valuable. Content is king is a phrase you’ve probably heard before. I hate the word content if truth be known. It devalues our knowledge and turns it into a commodity that is pumped out to please search engines. Yet for many of us, that knowledge has taken years to accrue and it is VALUABLE. So let’s call it knowledge and at least keep our self respect. You need to share your knowledge. Share it with everyone, your peers, your consumers and yes, even your competitors. Your knowledge can be shared in articles and comments and in video form. If you’re an expert in a particular field then offer to write an article on other sector specific websites and request they link back to your site – this quid pro quo is how the web works, all websites need information and you want something in return, which is a link, and you’ll find everyone understands this deal. Create your own Youtube channel and do short videos. Write a blog and update it every week if you can, but monthly if you’re busy. The general rule of thumb is a minimum of 300 words as often as you can manage it. If you’re into Twitter of Facebook link them back to your work. Google is looking for the experts, you can’t be a wallflower in this respect. If you are an expert you need to tell the world about it. If there is someone who’s doing better than you then look what they are doing. Are they writing more than you, are they getting people to link with them, are they sharing more knowledge, is their site better, faster? Take time to look at the competitive landscape and try to understand how you fit into it. If you’re not visible then get to work shining a light on what you do. This is what we have done to get ranked on Google for a key search term. No tricks, no dark arts, just playing it with a straight bat. It took about a year to get there and it is our plan to continue to do the work to get us to permanently be at the top and the market leader in what we do. There is no magic bullet, it’s a slow steady slog with one foot in front of another and if you start today within 6-12 months you could be ranked at the top. If you don’t start then you’ll never get picked up. If you want more info then drop us a line. We’re not pushy people and you won’t find a hard sell here – indeed usually we’ll give you lots of free advice that you can adopt yourself if you have the time. Contact Gavin on 0774 009 8092 or Gavin@bhmmedia.com for an initial conversation and we’ll see if we can help you. I’ve actually come to hate the term SEO. It’s a acronym that’s been tainted by dodgy dealers and con men for years now and I wish we could chuck it in the bin and find some other phrase. How about Getting Found On The Internet – GFOTI? When I talk to people about it I see them roll their eyes. They’ve been burned before. Some guy in pointy shoes promises they’ll be number one on Google for their keyword, it’s only a thousand a month. Four months in, nothing’s happened. But you’re locked into a contract for a year. And to make it worse you’re not entirely sure what they’re doing. It’s one of the reasons I got into this business. I was ripped off by a guy in Northampton who sold me the dream and delivered nothing. So I did a course which completely opened my eyes to the possibilities of digital marketing. The reality is that there isn’t some secret trick to getting found on Google that you need to pay some guy from Northampton with a cheap suit and pointy shoes to unlock for you. It’s having a plan and sticking to it. Healthcare SEO is no different to any other kinds of SEO of course, but there are three golden rules that you should make sure you get picked up by search engines – or optimizing your site for search engines. The main thing to remember is that you should always play it straight. Any agency should be able to tell you *exactly* what they are doing – there is no mystery here. It’s just effort and consistency. Really SEO is all about content. A regular post of at least 300 words at least twice a month is considered the minimum – the ideal is weekly, more if you can do it. Publishing your own videos and adding photographs are also invaluable. Remember images should be named something relating to your site or content and not GAVx334d as Google can read image file names. Video is very popular and since YouTube is also owned by Google and is the world second largest search engine it’s well worth investing in. An iPhone, a stand and a lapel mic should have you in business in no time. The more frequently you update your site the more Google will visit you to see what you’ve changed and the higher they’ll rate you. They’re looking for companies that engage with the internet. Talking about what you do is the way you do this. Links from relevant sites such as hospitals or clinic directories are useful. Similarly links from news outlets (national media, local media, magazine sites and blogs) relating to your subject are also very valuable. Links from a cement factory in Toronto are not useful. Google is trying to find experts so it looks at who’s linking to you. If it makes sense to them then you’re onto a winner. Also getting your site on free directories such as Yell and Thompson shows you’re connected in your local environment. Google also have their own listing service which is Google my Business which is essential. If you need a list of these then drop us a line and we’ll give you a list. I know this can be annoying as you’re probably already spent loads of money on a site and we’re now asking you to potentially spend more. Speak to us about getting it scored to see how your site preforms. Your site should be easy to navigate for the user, clearly marked with headings, keywords and images. It should be easy to crawl by the search engines, fast to load and work on mobile. Google is looking for the most user friendly and best informed websites and to comply isn’t usually a big job. One final point. We’ve had clients that want to be top of Google for highly competitive keywords. How you rank on Google isn’t just about what you do. The factors that determine how Google ranks a site are complex. The above come into play, but also how long the site has been going is also a factor which clearly you can’t influence (unless you have a time machine). You’re not going to jump up above someone who has been doing the same as you for the past decade, who updates his site daily, who has links from thousands of authority websites. SEO (or GFOTI) is a long game. If you want visitors from Google right now, the only way to get it is to open up your wallet, get your credit card out and pay for traffic with Adwords. I’m saying this only because I need to manage your expectations. Everyone wants to be top of Google so naturally it’s going to be hard. In the short term concentrate on your niche as this has less competition and is easier to go for. If you want an example of this then type into Google ‘Healthcare SEO’ – you’ll see our company bouncing around at position 5. It’s taken best part of 18 months to get here. For the term SEO we don’t even factor in the top 100. Going for a niche keyword has enabled me to not only target my specific niche, but it also it’s easier to get there. This is what any SEO agency should be doing and you can see that none of it is rocket science. Certainly none of it is a secret. If you have these bases covered you’ll see yourself picked up on search engines in no time. We’ve been carping on about the importance of having a mobile enabled site for a year or two now. Most of our clients are seeing half of their traffic come from a mobile device these days – and by ‘mobile’ we mean a tablet or a smart phone. Since Google is all about delivering the best possible experience to the user we have known for some time that being enabled for mobile gave you a tick on the algorithmic scorecard – otherwise known as good SEO. Now it’s looking like the they are about to action a new update which will actively reward a site that is mobile friendly and downgrade a site that is not. Google are quoted as saying it will ‘significantly impact’ mobile search results. Many experts are saying this algorithm change could have more impact on search results than the recents Google Panda and Penguin updates which has turned the whole way a site is found on its head. Putting this into plain English what this means is that all your mobile traffic is at risk if you don’t have a mobile friendly site. Or put another way, if a client is on the sofa surfing on their tablet at home in the evening and looking for you if you’re not mobile then you won’t get found. For those more detailed article on this can be found at : SearchEngineLand (click here). You can also read a less techy article here at Forbes. We’ve redeveloped our site this week to work on all mobile devices and above you can see us testing it to make sure it works. If you need some help getting your mobile strategy up to scratch then drop us a line and we’ll give you some free advice. Contact Gavin@bhmMedia.com or call 0774 009 8092.